Prosecutor Says White House Intruder Had 800 Rounds Of Ammunition In Car : The Two-Way Omar J. Gonzales, 42, jumped a fence and made it past the White House's North Portico doors before being apprehended by the Secret Service. 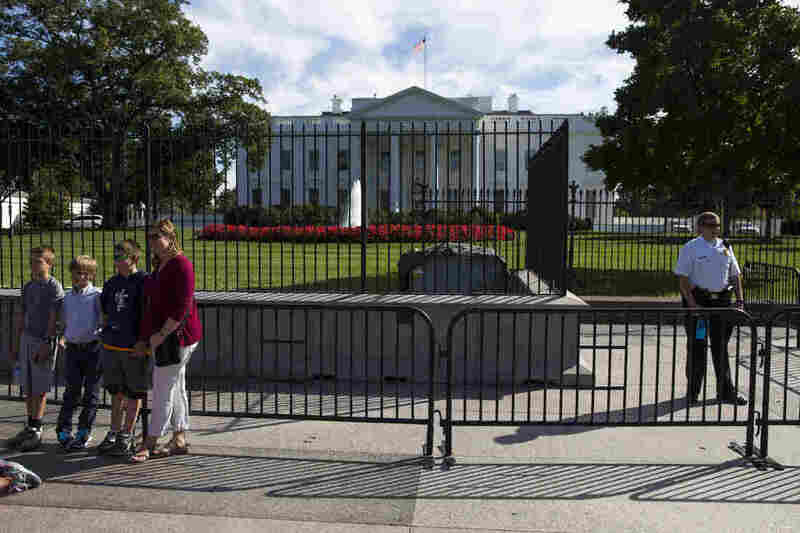 A Secret Service police officer stands nears tourists outside the White House on Monday. The man who jumped a fence and made it past the White House's North Portico on Friday had 800 rounds of ammunition inside his vehicle, a prosecutor said on Monday. "Prosecutor David Mudd revealed the new details about the high-profile security breach during an initial court appearance on Monday in Washington, D.C. At the hearing, suspect Omar J. Gonzalez, a 42-year-old Army veteran, was deemed a flight risk and ordered to be detained until his next hearing, set for Oct. 1. "At the court appearance, Mudd said Gonzalez had the hundreds of rounds of ammunition in his car, in addition to two hatchets and a machete. He called the intruder a danger to the president. "Gonzalez was quiet in the courtroom, expressing little emotion during the proceedings." As we reported, the incident has caused embarrassment for the Secret Service. Gonzalez made a run for the White House just minutes after President Obama left with his family for Camp David aboard Marine One. The Secret Service has stepped up its security posture since the breach. Citing "law enforcement officials," The New York Times reports that Gonzalez was also arrested in July with a "with a cache of automatic weapons, a sniper rifle and 'a map of Washington, D.C., with writing and a line drawn to the White House.' "
The Times adds that Gonzalez was charged with "reckless driving, one felony count of eluding police and possession of a sawed-off shotgun."